It is the policy and overall business objective of 4PLAS to provide products & services of the highest quality and in compliance with customers specified requirements. It is also our mission to enhance our reputation and capabilities in order to gain wider recognition in our field of expertise. 4PLAS recognises that genuine commitment to understanding the present and future needs of its customers is essential to the achievement of these objectives, and continually strives to ensure the needs and expectations of the customer are realised in the quality of the products, and services we provide. 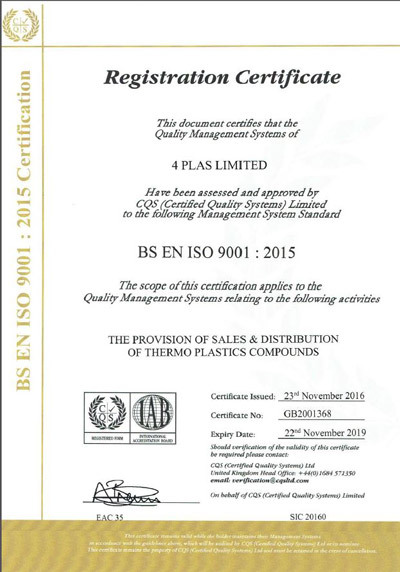 4PLAS maintains ISO 9001:2015 status, recognising the quality of our administrative and management systems. 4PLAS will constantly monitor its quality performance and will implement improvements where appropriate in order to maintain our quality ethos.